"My professor at the art academy in Berlin, Germany, once told me: You cannot paint, but you manage colors quite well. Later, my professor at the academy for textile engineering and Design in Krefeld, Germany said: Your handling of color could improve, but at least you can draw pretty well. Despite these remarks, I continued to draw, paint and used colors as I saw them fit. However, my real inspiration handling colors came in Venezuela. From my first day on, I loved to paint and draw in this colorful tropical country. I painted the village scenery and the way of life of their inhabitants, I also loved to paint the older colonial sections of Caracas. At home, I dedicated much time with designing Christmas cards and other illustrative work. I made designs for Batik hangers and for our Silkscreen- business." Barbara was born in Leipzig , Germany. She studied art at the "Hochschule fuer Bildende Kuenste" in Berlin, Textile design at the"Schule fuer Textil Design" in Krefeld. And she rounded off her art education at the prestigious "Blochener Schule" in Munich. 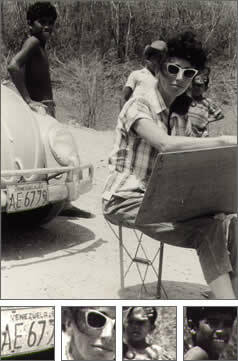 1967 Caracas : with Water Colors and Oil paintings at the"Galeria Gamma". 1969 Caracas : with Batik Hangers at the"Salon Oficial" of the "Bellas Artes" Museum. 1973 Caracas : with Batiks in Washington D.C. at the Millicent Chatel Gallery,. 1979 Caracas : with Water colors at "Galeria Felix". 1987 Caracas : with Water colors at "Galeria Felix". 1989 Caracas : with Batiks at "Galeria Felix". 1997 Caracas : with Water Colors and Oil paintings at the "Vaauw Gallery".